There are a wide range of appliances you can purchase all depending on how high-end you are willing to go and how much space you have available to house these appliances. From restaurant quality used by chefs and bakers to even professional grade, the quality of appliances is completely budget dependent. Shopping for your kitchen appliances begins after you have your space layout finalised based in which you can get a better understanding of the sizes and options available to you. For cook tops you can choose between inductions, electric or even traditional gas cylinders, the choice being completely personal to one’s requirement. While selecting a cook top, consider the efficiency in terms of heat from the burner to the pan. Studies reveal that gas cook tops show the highest amount of heat wastage (up to 40%). Flat cooktops or induction cookers have comparitively low amounts of heat loss. As far as ovens are concerned, choosing one that has an inbuilt fan that circulates the heat is much preferred as you can get your meals cooked faster and more evenly. Convention ovens are a much preferred choice over traditional ovens. However, if you’re considering plenty of baking/roasting, a traditional oven is better suited. Ventilation systems for your cooktops are essential to get rid of exhaust without making a lot of noise so this is also something you should consider. While making a purchase check whether you hear the sound of the suction and not just the motor. For freezers, besides the freestanding modules you have many appliance dealers now also selling fridges that will fit in to your built-in units. The main element for a freezer is the compressor. A dual compressor is much more efficient cooling as compared to a single compressor that would have to work double-time to keep the freezer cooler. Many prefer dual French door models which are suitable to most open spaces. For smaller spaces, you have the traditional model with the freezer on the top half. Next would be the microwave, which is a must have appliance in today’s cooking spaces. Convection microwaves are a popular choice in comparison to a fast speed oven, which consume more electricity and are longer on cooking time. Dishwashers are also finding their way in many homes across Goa. 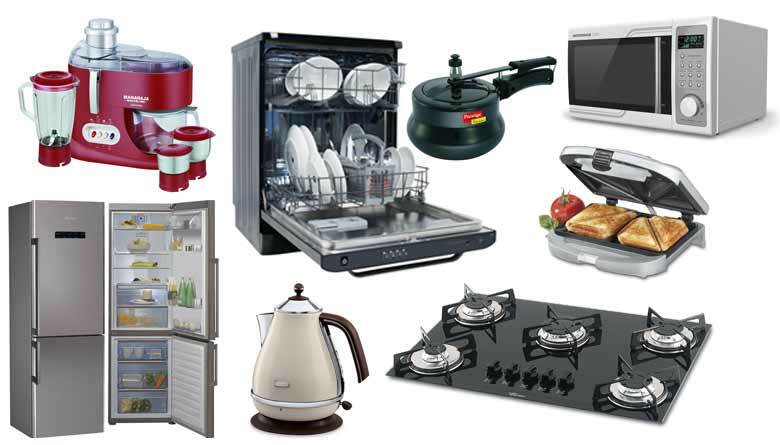 The choices available in the market are traditional top door dishwashers. However you also have the option of drawer dishwashers which can be installed at different heights according to your preference. Warming drawers are another luxury appliance gaining popularity among households that entertain guests regularly. Used to slightly warm plates before serving food, many ardent family cooks love to have one of these in their homes. We conduct site visits to provide you with a end product that is according to your needs keeping in mind the layout of the room, the finishes, lighting, etc. Call us for a consultation!